While the fate of New France was at times uncertain due to challenges to existing structures of governance and trade, perhaps the largest threat to its survival was the war between France and England that started in 1625. Its effects were felt in New France by 1628, when mercenaries led by the Kirke family, under commission from King Charles I of England, began to commandeer French ships on the St. Lawrence, including those sent by the Company of the Hundred Associates bound for Quebec with badly needed supplies. At Quebec, the colonists were left waiting for the arrival of provisions. When he learned that the British were at Tadoussac and that Cap Tourmente had been destroyed by Kirkes’s men, Champlain realized that the settlement was in great danger. Although Quebec did not come under attack in 1628, the Kirke mercenaries were well aware of its dire situation and pledged to return to seize the site the following year. The Quebec inhabitants experienced tremendous suffering during that winter. They were aided by their Aboriginal allies, including the Montagnais (Innu) and the Huron (Wendat), who fed and cared for 20 Frenchmen over the winter and spring of 1628-29. When spring arrived, Champlain continued to encourage the development of self-sustaining agricultural practices within the settlement. His efforts were largely in vain, however, as the Kirke brothers returned to New France in the spring of 1629 intent on capturing Quebec. With a monopoly of the St. Lawrence Valley fur trade, under the auspices of the Company of Adventurers to Canada, and a royal commission to destroy all French settlements, they were able to seize the beleaguered settlement without resistance. 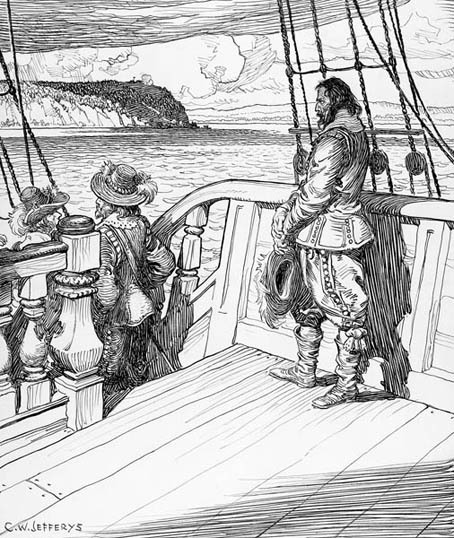 Although Champlain was permitted to remain in his quarters at Quebec, he eventually chose to travel to Tadoussac, where he waited to depart for England amid rumours that the war had ended. On his arrival in England, Champlain learned that the war was over and that England and France had signed a peace treaty before the capture of Quebec, meaning that the settlement had to be returned to the French. With this knowledge, Champlain travelled to London and prevailed on the French ambassador to assist in efforts to ensure that New France was returned to the French. Late in 1629, Champlain returned to Paris, where he continued to pursue the cause. It was not until 1632 that the Treaty of Saint-Germain-en-Laye returned the colony to France. In the meantime, Champlain kept up his efforts while forging new alliances with influential members of French society. He also published Voyages de la Nouvelle France in 1632, as well as a comprehensive map of the colony. In 1633, Champlain was able to return to New France in command of Quebec.